Western inspired video slot games have been gaining prominence in the virtual gaming community for its immersive graphic displays, exciting rewards, and a wide array of bonuses for its players. Their impressive reel mechanics also contribute on their continuing success in the industry. Thus, one of the most popiular Western based slot games today is Diamond Valley slot machine. Diamond Valley, which is already on its second installment, boasts its unique in-game features which truly justify the Wild West setting of the game. You may now play Diamond Valley free play slot here with no download required to know more of its features. 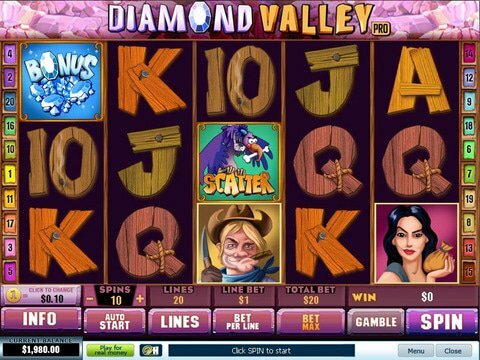 Initially released as a three-reel video slot game, Diamond Valley was redeveloped by Playtech software into a five-reel game with twenty payline options for its online and mobile players. You can place stakes as low as $1 to a maximum wager worth $5. Just like any other slot machine games, you should land matching combinations on the reels to win cash prizes and other exciting bonuses. These in-game characters include vultures, flaming bars, diamonds, chests, hand holding a diamond, and a set of teeth. Matching combinations of the following symbols reward you with different payouts and multipliers depending on the wagers you place. The highest paying combination available in this game is the alignment of diamond icons on the reels. This is triggered when five diamond symbols align on one active payline. This instantly gives you 5,000 credits on a maximum wager placed. Compared with other slot machine games, Diamond Valley does not offer any wild symbol on its reels. Instead, it has two special bonus features for its players. The first special feature involves the scatter symbol. The ruby icon serves as the scatter in this slot. If you land three or more scatter symbols on the reels, you will be rewarded with multipliers ranging from 5 times up to 200 times to your total wager. The second feature is Diamond Valley's bonus game. The hand holding a diamond character represents the bonus symbol for this round. You should line up three or more bonus symbols on an active payline to activate this bonus game feature. During this bonus round, three in-game characters will show up inside a hole. Each of them holds two bags which have different prizes inside. You get to choose one character from the hole and pick one of the bags he/she is holding to reveal your prize for this bonus game. If you want to try other slot games which feature diamonds on its reels, you may want to check famous slot titles like Diamond Jackpot, Diamond Dazzle, and Diamond Croupier. All these games also offer exciting rewards and bonuses. You may now play the demo version of Diamon Valley slot machine with no registration needed at Slots Million Casino. All Canadian players are also welcome to participate with free spins and no deposit bonuses.